If you enjoy collecting Lincoln pennies, then chances are you have at least a few 1972 pennies laying around. What is a 1972 penny worth? How do you know if you have the rare 1972 doubled die penny? What is the value of 1972 doubled die pennies? 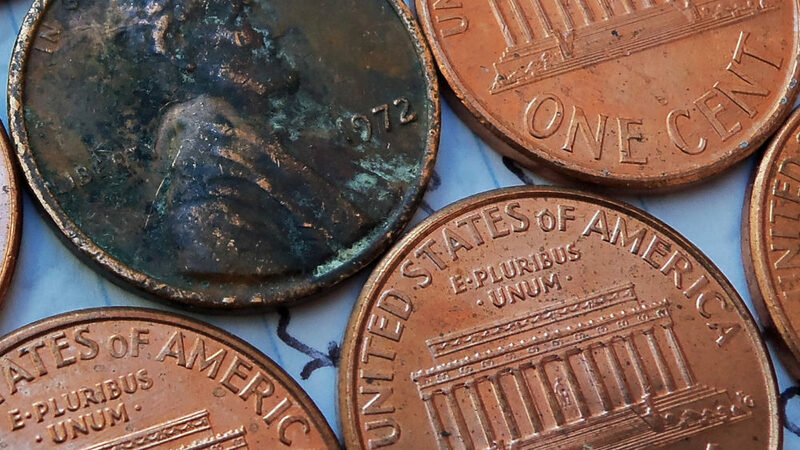 1972 pennies are made from a 95% copper, 5% zinc composition. They weigh 3.11 grams. They’re similar to other old pennies from the 1970s in that the obverse (“heads” side) bears a portrait of 16th United States president Abraham Lincoln, and the reverse (“tails” side) has a design of the Lincoln Memorial in Washington, D.C.
Lincoln has appeared on the penny since 1909. The Lincoln Memorial design on U.S. pennies was produced from 1959 through 2008. Lincoln Memorial pennies are generally very common — even though they’re no longer produced. The 1972 penny is one of the most common dates for the one-cent coin. More than 5.5 billion 1972 pennies were made. And most have entered circulation — meaning they’re worn, and thus those pieces are generally not very collectible. However, this doesn’t mean a 1972 penny isn’t worth saving! In addition to making circulation-strike Lincoln pennies, the San Francisco Mint (which produces coins with an “S” mintmark) made 1972 proof Lincoln Memorial pennies — which are usually worth $1 or so. Coin collectors especially enjoy finding these. Here are some tips for collecting proof Lincoln Memorial cents. One of the most rare pennies is the 1972 doubled die penny. Experts believe about 20,000 examples of the 1972 double die penny were accidentally made, and many of these are still circulating. So, it’s possible that you could find a 1972 doubled die penny in pocket change if you look carefully — and if you’re persistent. What’s the 1972 doubled die penny worth? Anywhere from $75 and up in circulated condition and easily into the hundreds of dollars if you find a well-preserved, uncirculated specimen in an old estate coin collection or bank roll. What Are 1972 Pennies Worth? A 1972 penny is definitely a keeper. Why’s that? Even though they’re generally common, 1972 pennies are worth at least 2 cents each for their copper value. While it’s presently illegal to melt copper pennies for their bullion value, they are no less trading hands at prices slightly above face value — because some collectors and coin hoarders anticipate the day when it’s OK to melt old pennies. Uncirculated and proof 1972 pennies are worth well more than face value. However, unless you find a 1972 doubled die penny or another type of error penny from that year, your 1972 penny is worth 2 cents. *Values are for problem-free coins (no cleanings, holes, porosity, etc.) in uncirculated condition or proof. Circulated pieces are generally worth about 2 cents, with the exception of the 1972 double die penny. What Else Happened When Your 1972 Penny Was Made? There was a lot happening in 1972! When your 1972 penny was made, there were dozens of significant events occurring throughout the United States and around the world, and plenty of cool pop culture news, too. 11 Israeli Olympic athletes were killed by a Palestinian terrorist group called Black September at the Games in Munich, Germany. It remains the deadliest and perhaps the most infamous of Olympic terrorist attacks. The Watergate scandal began when officials linked to President Richard Nixon’s reelection campaign wiretap the Democratic National Committee headquarters at the Watergate office complex in Washington, D.C. The illegal covert tactics were later exposed, and the infamous Watergate coverup led to President Nixon’s resignation in 1974. Hurricane Agnes pummelled Florida and later tracked through states in the Mid-Atlantic — killing 117 people along its course, including 48 in Pennsylvania. Devastating earthquakes in Iraq, Nicaragua, and Turkey collectively killed more than 15,000 people. The last United States ground troops left Vietnam. The Equal Rights Amendment passed the Senate but failed to gain support from enough states to achieve full ratification, dying in 1982. The Godfather, Cabaret, Deliverance, The Poseidon Adventure, and The Candidate were the top films on the silver screen. New TV shows included Maude, M*A*S*H, Kung Fu, Sanford and Son, The Bob Newhart Show, Emergency, and The Waltons. “Summer Breeze” by Seals & Croft, “The Candy Man” by Sammy Davis, Jr., “You Don’t Mess Around With Jim” by Jim Croce, “Brandy (You’re A Fine Girl)” by Looking Glass, “Rocket Man” by Elton John, and “Where is the Love” by Roberta Flack were all Top 40 songs in 1972.